We have been at sea for what seems like an eternity. I can't wait to stand on solid ground again, or to taste fresh fruit rather than salted meat and hard ship biscuit. The sailors are restless and want to return to Spain. They are afraid of sea monsters and whirlpools, and it is all that I can do to keep them from mutiny. I have my ambition to discover China to keep me going, but I have had to promise gold to the first sailor who sights land to keep them going in this direction. Wait-- what did I just hear? Land ho? Yes, it is! A sailor has spotted land! We have arrived in China! "Christopher Columbus: the First Voyage." The Mariners' Museum. Stephen Cunha, n.d. Web. 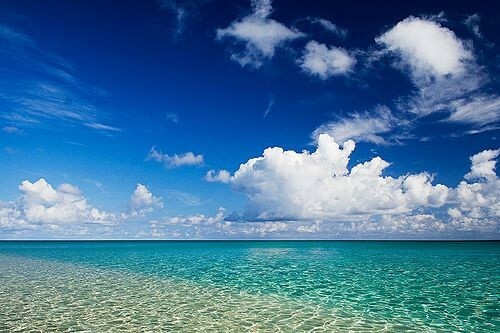 Cuba-water. Photograph. United Travel Agency. Web. 14 Mar. 2012. 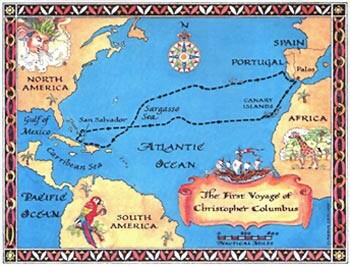 Map of Columbus's First Voyage. Photograph. Columbus Day. By Joanne L. Gardiner. Advantage Realty. Web. 14 Mar. 2012. Photograph. 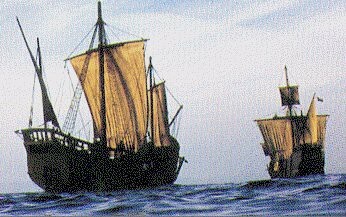 Columbus's Ships. By Pickering A. Keith. Web. 14 Mar. 2012. <http://www.columbusnavigation.com/ships.shtml>.